There comes a time in every carpet's life when it needs a professional clean-up. When that day comes, you will be glad to know that San Antonio Carpet Cleaning, the region's experts in stain removal, rug and carpet steam cleaning and pet odor removal, are only a phone call away. Stains, dirt, pet's hair and even the steps you take on your carpet leave their marks and it becomes deeper and deeper embedded, and pushing down the pile. Eventually, the base of your carpet will become embedded with a layer of pollutants that certainly bring with them undesirable side effects, such as unpleasant odors, mite infestation, carpet deterioration, discoloration and more. Carpet Cleaning San Antonio offers the perfect solution for you - steam cleaning. Steam cleaning actually starts with vacuuming, using an industrial vacuum cleaner, in order to remove as much dirt as possible. 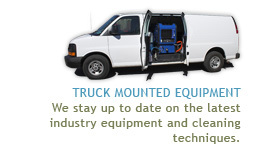 Then, San Antonio Carpet Cleaning uses truck mounted unites, hose and wands, to shine your house. The high pressure, hot water, coming from the truck, is sprayed to the carpet. In most cases, no harsh detergents, shampoos or other toxins are required. When additives are used, make sure to request Eco-friendly, green cleaning solutions. Poorly maintained machines, or machines with inadequate suction power, are likely to leave your carpets a muddy mess. Even worse, you may think you have done a good job only to discover that the carpet has remained damp. Then it becomes an incubator for bacteria, fungi and other unwanted impurities. Extend the life of your carpet with San Antonio Carpet Cleaning. Call 210-858-9124 now to get your free quote.